Reading is a way in which many people find their peace and solace. Be it fiction, humour or something as valuable as self improvment books. We thought why not make the bloggers rewind their collection and tweak the stories. So last weekend in our prompt 'Books And Titles' we made our bloggers select any two of their favorite titles and weave a story around it. Below are the posts you cannot miss. 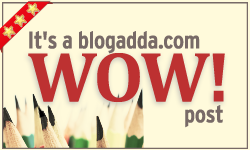 Thanks BlogAdda. It was a great prompt.